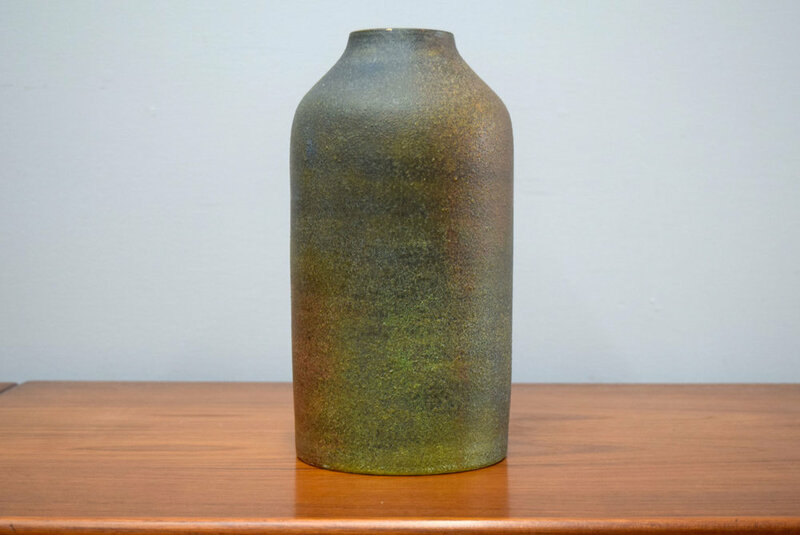 A rare and exceptional large handmade vase designed by Aldo Londi for Bitossi, Montelupo Italy. Big stylish bottle shaped vase of light red clay with a rare crackle glaze from the 'Etruscan' line. subtly glazed in dark graphite with a wonderful, rare underglaze of big dots of bright Rimini blue, orange and light green. Graphite outer glaze shows a gorgeous crackle in the thin areas. Retains Raymor Tag “2342 Raymor BIT” and signed “1036 Italy”. 10 5/8” h x 5 1/2” diameter. In excellent vintage condition with one tiny glaze chip on the rim as shown.